It stands a little over 85 meters and is almost completely in wood. The name of the 'green' skyscraper that has just opened its doors in Brumunddal, in Norway, is Mjøstårnet. The construction stands above other environmentally-friendly buildings around the world, such as the Viennese HoHO tower (84 meters of wood and cement) and the Brock Commons of Vancouver (52.7 meters) with its 18 floors 100% wood. 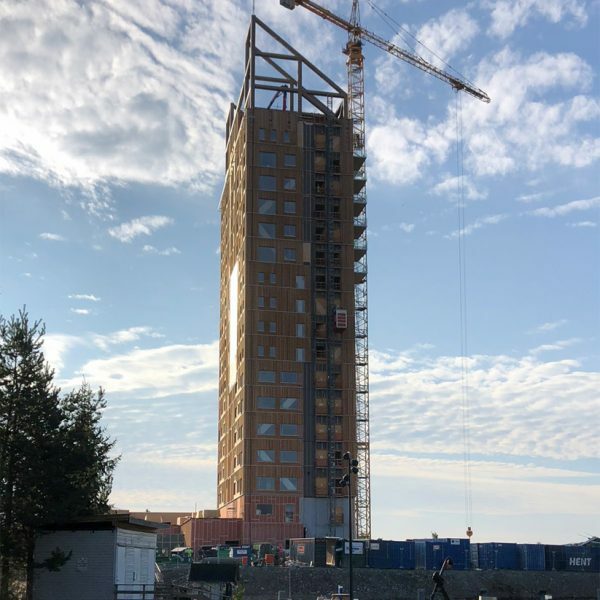 The new Norwegian skyscraper, built in cross-laminated timber (CLT) has outdid expectations of the builders: two years ago, the ambitious project began by focusing on the exclusive use of wooden materials and the work even went beyond the expectations of the company, Moelven Limtre, which together with Voll Arkitekter and Sweco had planned to reach 81 meters of height. Four floors at a time, in five stages, the building was erected meter by meter. But to challenge the forces of nature, the architects had to reconsider their plans so as to provide greater resistance to the wind and finally the building reached 85 meters of height. In its 11,300 square meters of floor space on 18 floors, Mjøstårnet - the third tallest building in the country - hosts apartments, a hotel, restaurants and common areas, as well as a 4,700 square meter pool. Unlike other hybrid structures, however, the Norwegian skyscraper does not hide a concrete 'heart', but wooden structures - columns, beams and diagonals - to support it and panels made of organic material to cover the elevator shafts and the stairs. This is also thanks to the fact that cross-laminated timber, produced with spruce boards, as well as resisting large loads and natural stresses, is a slow-combustion material which does not release toxic fumes. Now the Mjøstårnet can also look down on the Treet, the hybrid tower block built in Bergen, Norway, between 2007 and 2014, which with its 49 meters was until recently the tallest of its kind. The Norwegian giant of Brumunddal has surpassed it even in the percentage of used wood and can now enjoy its world-record. However, at some point it will be surpassed by the futuristic W350, a Japanese project that will see a record wooden tower rise by 2041. The Mjøstårnet is a completely sustainable project: The CEO of Moelven, Morten Kristiansen, has explained that the company has planted two new trees for each plant harvested to obtain raw materials.